South facade of insula V 1, along Via Nola. As could be expected, the south front of Insula V 1 has a verry comercial character. Via di Nola, which it alignes to is one of the two main east-western running thouroughfares of the town. 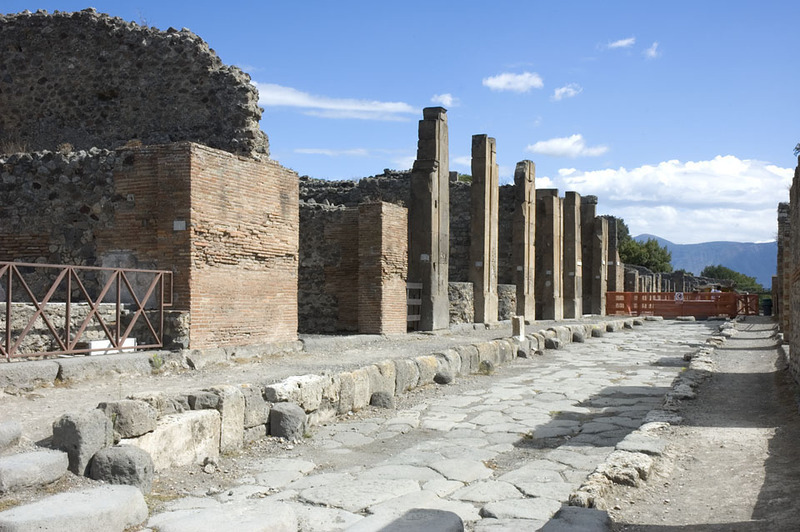 It is, indeed, the only one, on which the Pompeians or visitors could pass from the east (Porta di Nola) to the northwest (Porta di Ercolano) on wheeled means of traffic. On the relatively short portion of this street, which runs along Insula V 1 (approx. 42,5 m) no less than six shops, taverns or crafts enterprises open up for customers: one tavern (V 1,1.32, see contribution by H. Boman on this website), one fullery (V 1,2, see contribution by S. Blandman on this website), two tinctoriae (V 1,4 + V 1,5, see contribution by H. Boman on this website and Bogard 2002 and 2005) and two shops of unkown profession (V 1,6 + V 1,8, see contribution of T. Staub on this website). In most cases probably the shopkeeper lived in a quite small appartment on the upper floor. Only two residential entities are in this Insula entered from Via di Nola: the large Casa del Torello (V 1,7, see contibution by T. Staub on this website) and the smaller Hous V 1,3 (see contibution of R. Forsell on this website). The last one, originally an independent dwelling was at some time integrated into the Casa del Torello as a secondary atrium area, but had before AD 79 regained some of its self sufficiency. There are several indications, that the entire southern part was owned by one person, the owner of the Casa del Torello (see below and Leander Touati 2010). The eastern part of the facade (from V 1,3 eastwards) is articulated by means of shallow pilasters protruding in the centre of each wall section between the openings towards the street, with the exception of the two that frame the main entrance of Casa del Torello and the last one to the east, which marks the southeast corner towards the Vicolo di Caecilius Iucundus. At the entrance to the main house, the pilasters are not placed in the centre of the wall portions but instead frame the entrance itself and were crowned by figural capitals. At the southeast corner of the facade the pilaster is moved to the corner, as if to frame the whole façade from the east. A similar corner pilaster probably framed the western corner in the original layout as well. Hypothetically, in the last building phase of this façade, this western corner pilaster as well as the assumed central ones on the wall portions between V 1,1 - V 1,2 and V 1,2 - V 1,3 may have been copied in stucco. Considering the shallowness of the original tufa pilasters (0.04 m), no more substantial means of construction were needed to recreate the homogeneous structure of this front. To compare, on the facade of the Casa del Fauno the later, added street entrance to the side atrium (constructed in the beginning of the 1st cent. B.C., see Hoffmann 2009, p. 21) was framed by pilasters made of tiles, to insert this new element into the “frame” of the pre-existing tufa-front of this house. Remains of a stuccoed pilaster from a secondary building phase on the eastern front of the same house are examples for the structuring of a front in this material, see Hoffmann, 1990, p. 491 with note 12. The entrance to the main house, V 1,7, is ennobled in a striking way both by its dimensions and by the framing pilasters. Even if the other atrium house entrance (V 1,3) on the southern side of the insula is framed by pilasters as well, the much humbler dimensions and the relative simplicity of the cube capital still in place signal the entrance of V 1,3 as ranking lower than the more monumental entrance of the Casa del Torello with its elaborate capitals. Thus already from the beginning, the structure of the southern part of the insula clearly had one dominant house in relation to the others. It is therefore possible to suggest that there are two levels in the articulation of the façade along this part of the Via di Nola. The first one relates to the entire southern side of the insula, the second one, to individual houses. The first level structures the entire southern front of the insula, made up by the framing corner pilasters to the east and (assumedly) to the west, the pilasters structuring the wall portions between the different tabernae and the clearly articulated ranking of the originally two atrium houses. For a discussion of the use of the word façade in Roman architecture, see Geesemann 1996, 101 - 106, who may be slightly too cautious when defining the front of the Casa del Fauno: “... müßte man hier, wenn nicht von Fassaden, so doch zumindest von “unvollkommenen Fassaden” oder “Proto-Fassaden” sprechen.” (104, note 16). The second level is constituted by the individual façades of the different dwellings, especially for V 1,7 and V 1,3, consisting of the wall portions next to the entrances, embellished by pilasters and capitals. It has been observed earlier that a single ownership of this entire part seems probable already from the beginning of its history, mainly due to the uniform facade along the entire south side. (Dickmann 1999, 80f) That this ownership continued during the history of the property has been convincingly argued for, mainly through the study of the upper floors and their interaction with the ground floor levels belonging to several separate building units in this area. (Pirson 1999, 157) This single ownership has been confirmed by observations made concerning the interrelationship of the water provision and the waste-water discharge during the investigation of the Swedish Pompeii Project. For a more detailed study of the complex interrelationships between the different entities in the southern part of this insula and further arguments for a single ownership of these parts, see Leander Touati 2010, passim. Substantial amounts of electoral inscriptions were observed on the façades when the building was unearthed, as so often was the case, especially concerning façades along the main or more important streets. Except for some fragments of primarily red colour, nothing is preserved of these dipinti today, but they were documented shortly after the excavation and were later published by Zangenmeister in CIL IV. For a complete list and translation see the contribution by K. Lundqvist ("Inscriptions") on this website. The paving of the sidewalk is mostly destroyed: only in some parts between V 1,3 and V 1,7 are some remains of a lava-pesta floor with inserted coloured and black stones visible, continuing into the fauces of V 1,3 as well. Whether this paving continued further to the west including the area in front of the shops and tabernae towards the corner can no longer be determined. In front of the façade between V 1,3 and V 1,4, a small pillar fountain is placed on the curb stone. 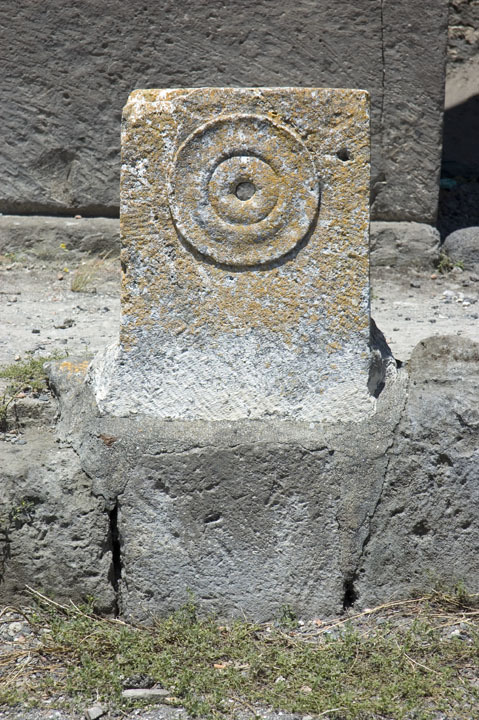 This is one of three examples in Pompeii of such fountains lacking a basin in front of them and the only one made of travertine and adorned by a small relief with a patera motif. The location of our fountain is quite surprising, since the next “normal” public fountain is situated at the southwest corner of insula VI 14 only around 20 m away. Thus, the provision of water was insured according to the average distances between fountains for this area. The other pillar fountains are placed more in accordance with the needs for drinking water and could thus be elements of the water provision for the citizens. It has been suggested that this small group of fountains could have functioned as places for drinking water, where passers-by would drink directly from the pipe, as at modern street fountains in, for example, Italy. (See Eschebach - Schäfer 1983, 31 and Jansen 2002, 47.) Whereas this could be true for the other two fountains, where indeed the placing of a bucket underneath is hampered by the position of protective lava stones in front of them, the same does not apply in our case. Here the protective stones are placed along the entire façade more or less equidistant from each other (see below), but the place under the fountain is left free, so that it was possible to fill a bucket placed on the street. It could be argued for a private endowment of this facility for several reasons first, judging by the material and décor, which blend in with the adornment of the façade; second, its location so near the “regular” fountain; and third, the difference of the possibilities of its use as compared to the other, similar ones. The fountain could improve the conditions for the tenants of the water-consuming industries of the laundry in V 1,2 and the dyers in V 1,4 and V 1,5, probably provided by the owner of the southern part of the insula. Thus it could be a part of the steps that the owner of the Casa di Torello took improve conditions for his tenants or clients, as suggested for this part of the insula by Leander Touati. (See Leander Touati 2010, 136-137.) It even seems plausible that the water pipe leading to this fountain, of which nothing is preserved, was connected to the first main water distribution box of the Casa di Torello in the kitchen (room l), since there is one pipe with an attached tap running in that direction, a pipe whose function otherwise would be unaccounted for. In front of the curb stones of the sidewalk, rounded lava stones (average 0.4 x 0.3 m) are set up at a distance of 3.5 to 4.5 m. It was observed already in the 18th century that these stones, which can be found elsewhere in Pompeii as well, (For a list of the placement of these stones, see Saliou 1999, tab. 2, 207) served as some kind of sidewalk protection. There are indeed three different elements along this part of the northern side of Via di Nola which could explain the need for protective measures. The first one is the small pillar fountain presented above. The second element is the curb stones themselves in the western part of the sidewalk. Here the sidewalk reaches a height of max. 0.8 m which implies, that the curb stones could have been damaged by the protruding axles of the vehicles passing by. According to Hartnett the height of the axles was between 0.45 - 0.75 m. On the front of the curb stones in front of the Caserma dei Gladiatori the axles have carved furrows into the stones, see Hartnett 2011, 154 and fig. 5.8. The third element that could have led to the placing of these rounded lava stones was suggested to me by Henrik Boman. : near the western end of our portion of Via di Nola, three stepping stones are placed in the street to enable pedestrians to cross over. The northernmost of them is placed directly abutting the curb stone, so that the wheel of a vehicle would not have been able pass through the curb stone and stepping stone. Thus the protecting stones forced the drivers to drive further to the south, avoiding a collision with the stepping stone. 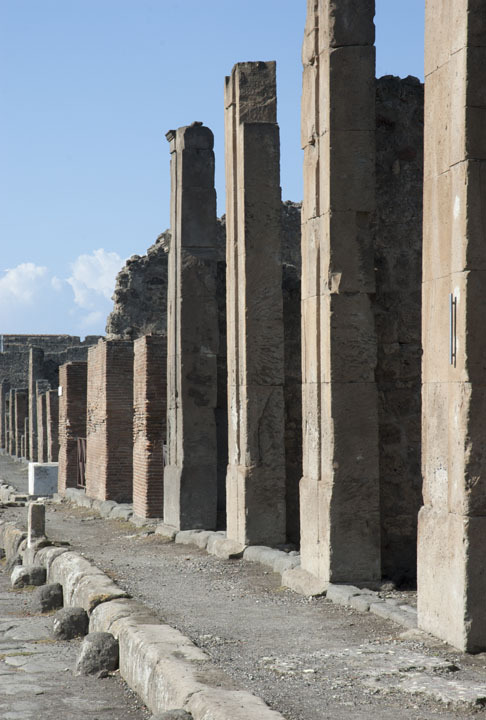 When the situation in front of the southern side of insula V 1 is compared with other street borders in Pompeii it becomes evident that there was no overall rule for the distribution of these protective stones. 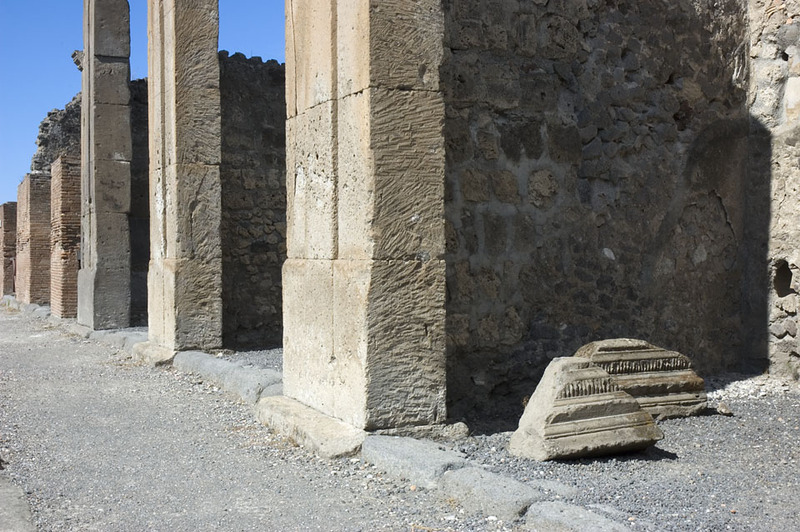 As mentioned above, the other two pillar fountains are protected by a single lava stone, placed directly in front of them and not by a row of stones along the entire street. 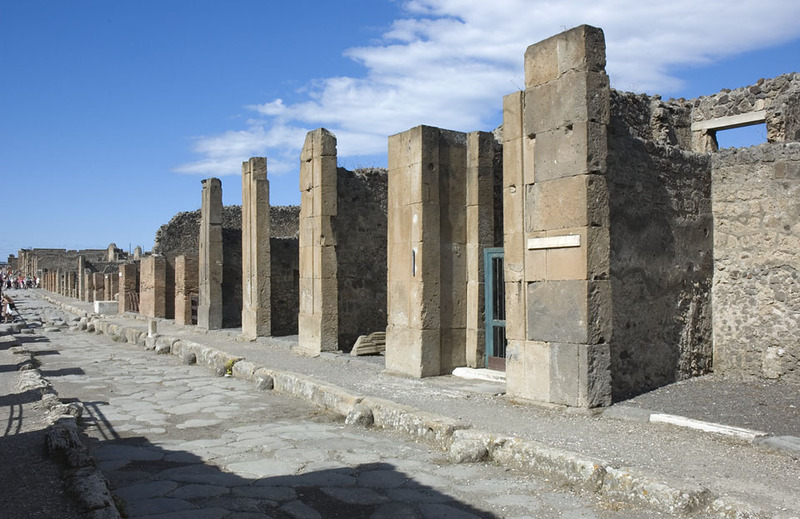 This is similar of the way that the street-side corners of the (square) basins in front of the normal public fountains in Pompeii are protected by one lava block in front of each corner. The very high sidewalk in front of the Caserma dei Gladiatori, for example, was not protected, which led to the damage caused by the protruding axles of passing vehicles. The stepping stone at the western side of the Via di Stabia in front of VII 2,1 is an example of such a stepping stone abutting the sidewalk without a protection for the vehicles. It seems thus that the placement of these stones was undertaken by the house owners themselves and not by some official. This can also explain the fact that these rows of stones are normally related to the width of the plot behind. An entire street front is equipped with protective stones only when the house or property of one single person stretches along the entire side. This is for example the case at the southern side of the Casa del Fauno (VI 12), the southern side of the Casa dei Vettii (VI 15,1.27), the southern side of the Casa del Labirinto (VI 11,9.10) and the southern side of the Casa del Naviglio (VI 10, 11.14). Therefore this row of protective stones in front of the southern side of insula V 1 is a further indication that the southern part was owned by one single person. According to Hartnett the height of the axles was between 0.45 ??" 0.75 m. On the front of the curb stones in front of the Caserma dei Gladiatori the axles have carved furrows into the stones, see Hartnett 2011, 154 and fig. 5.8. Ph. Borgard 2002, ’À propos des teintureries de Pompéi: example de l’officina infectoria V, 1, 4’, in Les Artisans dans la ville antique (Collection de l’Institut d’archéologie et d’histoire de l’Antiquité, 6), Université Lumière Lyon 2, 55-67. P. Borgard et al. 2005, ’Recherches sur les productions artisanales à Pompéi et à Herculanum’, in Nuove ricerche archeologiche a Pompei ed Ercolano, Studi della Soprintendenza archeologica di Pompei 10, 296-298. J.-A. Dickmann, Domus frequentata: anspruchsvolles Wohnen im pompejanischen Stadthaus, München 1999. H. Eschebach, T. Schäfer, Die öffentlichen Laufbrunnen Pompejis. Katalog und Beschreibung, in: Pompeii, Herculaneum, Stabiae, 1, 1983, p. 11 ??" 40. B. Gesemann, Die Strassen der antiken Stadt Pompeji: Entwicklung und Gestaltung, Frankfurt 1996. J. Hartnett, The power of nuisances on the Roman Street, in: R. Lawrence, D.J. Newsome (eds. ), Rome, Ostia Pompeii. Movements and Space, Oxford 2011, p. 135 ??" 159. A. Hoffmann, Elemente bürgerlicher Repräsentation. Eine späthellenistische Hausfassade in Pompeji, in: Akten des XIII Internationalen Kongresses für Klassische Archäologie Berlin 1988, Mainz 1990, p. 490 - 495. A. Hoffmann, Bauhistorische Analyse, in A. Faber - A. Hoffmann, Die Casa del Fauno in Pompeji (VI 12), 1, Wiesbaden 2009, p. 19 - 54. G. Jansen, Water in de Romaine stad, Maastricht, 2002. A.-M. Leander Touati, Water, well-being and social complexity in Insula V 1. 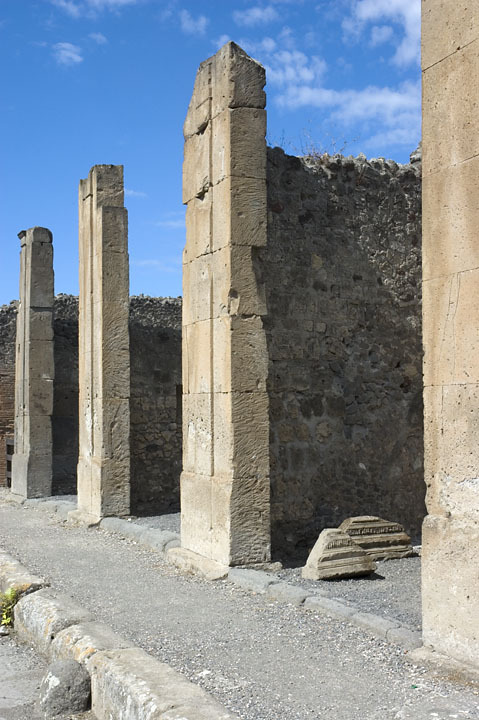 A Pompeian city block revisited, in: Opuscula, 3, 2010, p. 105-161. F. Pirson, Mietwohnungen in Pompeji und Herkulaneum, München 1999. C. Saliou, Les Trottoirs de Pompéi. Une première approche, in: BABesch 74, 1999, p. 161 ??" 218. V. Spinazzalo, Pompei alla luce degli scavi nuovi di Via dell’Abbondanza (1910 ??" 1923), Roma, 1953. Facade along Via Nola from SW. Facade along Via Nola from SE. Facade along Via Nola from SE, 2012. 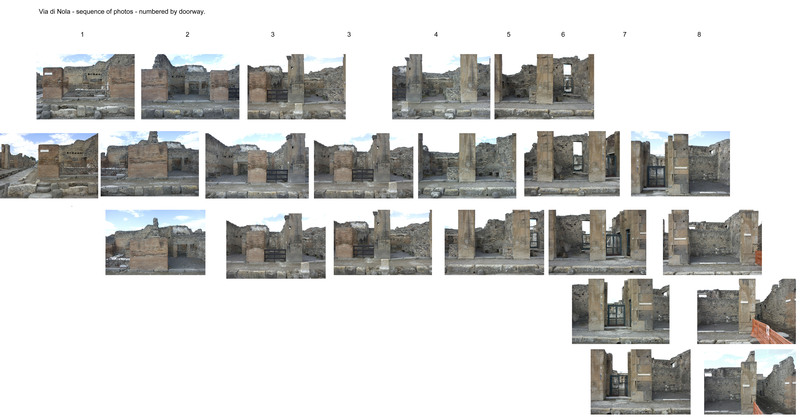 Montage of the photos of the facade.